Movie: After an abrupt and violent encounter with a French warship inflicts severe damage upon his ship, a captain of the British Royal Navy begins a chase over two oceans to capture or destroy the enemy, though he must weigh his commitment to duty and ferocious pursuit of glory against the safety of his devoted crew, including the ship's thoughtful surgeon, his best friend. For England, for home, and for the prize! 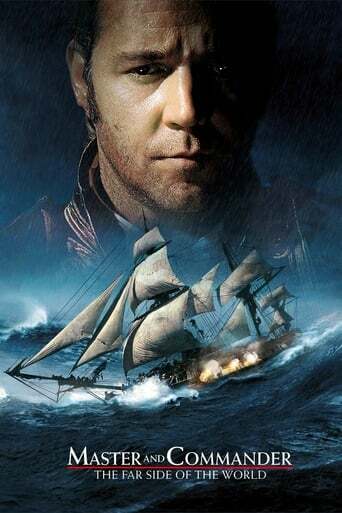 Master and Commander: The Far Side of the World is directed by Peter Weir, it stars Russell Crowe as Jack Aubrey and Paul Bettany as Stephen Maturin. It is spliced from various novels in the Aubrey–Maturin series written by Patrick O'Brian. The film takes place during 1805, during the Napoleonic Wars and finds Captain Jack Aubrey and the crew of British frigate HMS Surprise ordered to intercept, destroy or take as a prize the French privateer Acheron. But the Acheron (The Phantom as the crew of the Surprise call her) is no ordinary ship, and her Ca... read the rest.